Khoya Gulab Jamun, the king of all Indian sweets, is made of a dough consisting mainly of milk solids glazed in a sugary syrup often flavored with cardamom and saffron and rose water. It is very rich and sweet even without the sugar syrup coat. 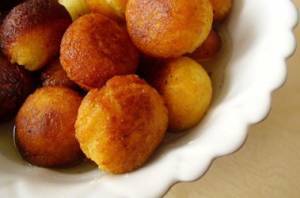 Gulab Jamun are cake-like fried milk balls in a simple sugar syrup. The dough for this dish takes only minutes to assemble, but the balls must be fried very slowly under carefully controlled temperatures. Some recipes increase the flour content in order to minimize the importance of the heat regulation; but the less flour there is in the dough, the better the quality of the Gulab Jamun. If the balls are browned too quickly or not fried long enough, they tend to collapse in the sugar syrup. Because the balls must be constantly agitated while they are being fried, make sure you have no distractions while you are cooking these wonderful treats. Gulab Jamuns are good sweets for festive moments, such as holidays and entertaining. They may be served warm or at room temperature. 2. Make the dough adding the heavy whipping cream. 3. Shape the Gulab Jamun into an oval shape. 4. Deep fry Gulab Jamun in oil. 5. Boil the water and sugar until it becomes a little thick. 6. Soak the Gulab Jamun in the syrup. 7. Let Gulab Jamun cool. 1. In a microwaveable bowl mix full cream milk powder, thickened cream and sweetened condensed milk. 2. Place the bowl in microwave oven on HIGH for 4-5 minutes, then stir the mixture and then microwave again on HIGH again for another 4-5 minutes. 1. Cut the oval shaped Gulab Jamun into 3/4 inch pieces and fill each piece with Khoya mixture. 2. Sprinkle Gulab Jamun with pistachio/almond/cardamom powder (optional). 3. Delicious Khoya Gulab Jamun is ready to be served. Nice recipe. Gulab Jamun is not just a famous indian recipe. Its also very famous in Pakistan. Lots of different varieties of Gulab Jamuns are made in Pakistan.